Some say imitation is the sincerest form of flattery, and every now and then, they’re right. Milanoir touts itself as a tribute to cheesy ‘70s Italian crime films, the likes of which are “revered by Quentin Tarantino.” And in a way, it succeeds. Its action sequences and dialogue definitely drip with pulpy snark. Thanks to this, Milanoir is entertaining but not always endearing—almost every other line has the protagonist, Piero, proclaim how cool he is and how little he cares. Even as the shade-wearing macho man commits some sincerely surprising and heinous crimes, his superiority complex never lets up. Yes, this writing is intentional, but that doesn’t make it any less grating. Within the grand hierarchy of the mafia, Piero is content with being a hitman. He’s pretty good at it, and shootouts make up a solid majority of his story in Milanoir. These fights use a basic top-down combat system. You can hide behind waist-high props, then bounce up to pop a cap in an enemy when you need to. Though you’re armed with only a pistol (and very very occasionally find other short-lived weapons), Milanoir uses a fun ricochet system to make its fights a little more interesting. If you see a street sign, you can shoot it to bounce your bullet off the sign and instantly kill a nearby goon. More signs are later introduced and do different things. A triangle sign, for instance, will split your bullet in two, killing two enemies at once. Sometimes these blend in with the overly busy pixel-art backdrop, but thankfully, they also shine in the light every few seconds to make them a bit more noticeable. Still, tiny signs aren’t exactly easy to notice and shoot in a frenetic fire-fight. It doesn’t help that Milanoir’s aiming system is clunky and awkward. A large, flashing reticle serves as your aim marker, and is surrounded by small marks that represent your bullets. This system probably works very well on PC, as it’s basically a giant mouse cursor. But on PS4, the reticle is moved with the right analog stick, and is alarmingly finicky. At the lowest sensitivity, it’s impossible to quickly aim when you’re surrounded. On the highest setting, it’s hard to fine-tune your shots. When you walk, your cursor moves with you, meaning that running and gunning turns everything around you into a moving target. The PS4 version also has an “aim assist” that will lock your cursor onto an enemy when you pass over one, but it doesn’t always work. Street signs—the small, shining stars in Milanoir’s combat—aren’t even recognized by this assist. This setting steers you away from one of the most enjoyable parts of the game. Most fights start with one sign, six or seven enemies, and next to no nearby cover. In such cases, Piero takes about three or four shots, then he’s six feet under. 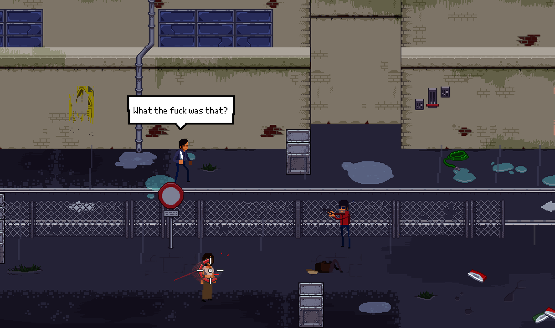 This is all super aggravating in boss fights, where sign shooting, movement, and cover are equally important. Milanoir has some cool boss designs, a lot of which are completely undermined by the aiming system. Some fights slip by unscathed, such as an early motel gang shootout that morphs into a high-speed van chase. But in another battle, I had to simultaneously shoot at and run from a moving train. As it tried to ram me, I awkwardly shimmed my way into an adjacent alley. Next, I had to continue my escape on the tracks, while shooting at intermittent, moving street signs nearby. Any mistake—or even brief stop—meant that I would be mowed down by an Italian maniac in a death trap. What began as a genuinely fun concept soon turned to 20+ straight minutes of quick, repeated deaths. Reviewer’s Note: To see what this boss fight looks like, check the last 5 minutes of the video above. These deaths sting marginally less when experienced alongside a friend. Milanoir has co-op, and though your run resets if either player dies, it’s still a fun way to lighten the mood. Playing with a friend evokes the same vibe as marathoning dreadfully over-the-top action movies. Not many recent games capture this feeling, so it was a nice surprise here. Whether the game was truly intended for this, who knows, but that atmosphere is another positive to tie the experience together. 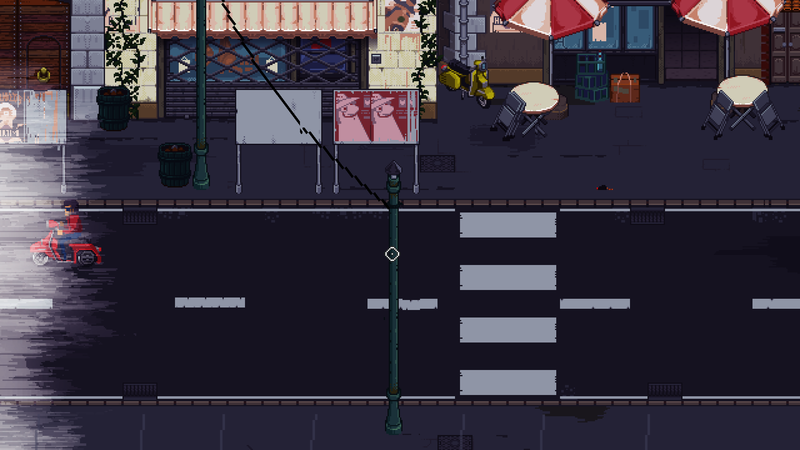 Milanoir provides pleasure in its own roundabout, corny, lighthearted way. Sure, its combat is very obtuse, awkward, and confounding. I became emotionally detached from Piero as his dense, cocky attitude drained my soul. But with a few neat mechanics and a well-rendered art style, this whimsical crime-film imitation flatters some of its ancestors and lightly entertains with the same campy charm. Milanoir review code provided by publisher. Version 1.00 reviewed on a PlayStation 4 Pro. For more information on scoring please see our Review Policy here.